We can use words to hide truths. When we use our words to hide truths we enter dangerous territory. This is an argument used by many who want to say negative things about Autism- which is actually saying negative things about Autistic people. They say that we need to be “honest” and talk about the difficult things so parents don’t feel isolated and so they can get support. The problem here is that help and support are available without compromising the privacy and dignity of other people. The truth here is that parents who use this argument are mostly looking for sympathy and validation of their feelings of frustration, and are giving a different reason because they think it is more acceptable to others. They are hiding truth. We can use words to create truths. When a person feels something and they are not sure if it will be acceptable to others they are likely to keep it to themselves. Occasionally someone will be brave enough to speak that feeling to test if it will be acceptable. If they find sympathy for their thoughts and feelings they will repeat them. The more those thoughts and feelings are repeated, the more strength they gain. They are said to someone else who so far has not been willing to say them. That person realises someone else has said them, so they say them too. It goes on. Dialogues and scripts are formed and begin to grow and gather momentum. At the same time as hiding truths, the argument that “honesty” (negativity) is crucial to getting support helps to create truths. 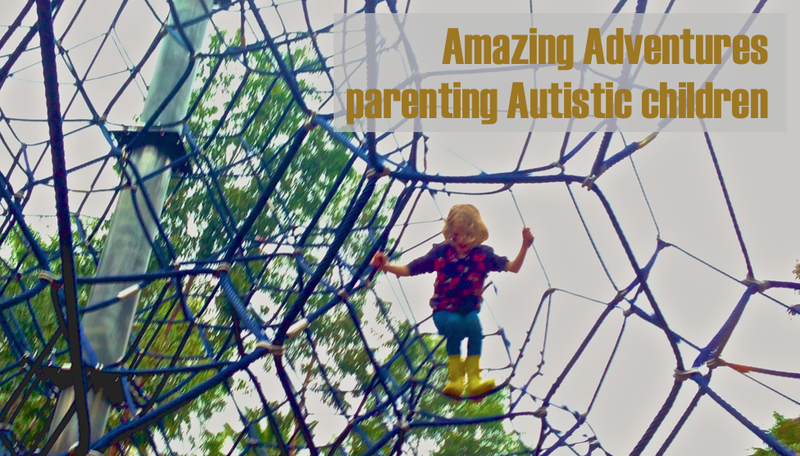 When parents prioritise telling their stories of hardship over maintaining the dignity of their Autistic children we see trends in conversations emerge. There are now an easily predictable set of responses to every news story involving an Autistic person that is published. Autistic child bullied at school? They need to have social skills training so they don’t stand out as different. Autistic person goes missing? Must be in their own world and drawn to water. Person goes on a shooting spree? Bet they were Autistic to have been so socially isolated, weird and aggressive. Autistic person killed by their parent? Oh, poor parent, they must have had it so hard. We've all seen these conversations. They are hard to miss. By using negativity as the dominant theme in conversations about Autism a truth has been created. People are now scared of Autism. People are scared to know an Autistic person. People are scared to birth an Autistic child. We can use words to expose truths. It is true that people are scared of Autism. It is true that negative stories from parents of Autistic children, along with dramatic fundraising drives and alarmist awareness raising campaigns, have contributed to that fear. It is true that making people afraid of Autism erodes the rights of Autistic people and endangers their lives. It is possible to use our words to tell this story, just as it has been possible for people to create the truth of fear of Autism. In the same way as a parent speaking those first tentative words of negativity contributes to creating truths, we can use words to boldly expose the truth of damages caused and the need for change. We can use words to uphold truths. 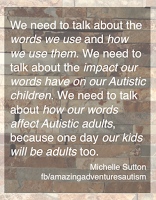 Coming back to the words of Autistic people, and telling them to other people, is a way to uphold truth. When we want to know about Autism and we ask an Autistic person, visit a blog written by an Autistic person, read a book authored by an Autistic person we are upholding truths about Autism and the experience of Autistic people. When someone asks us about Autism and we send them to ask an Autistic person, visit a blog written by an Autistic person, read a book authored by an Autistic person we give strength to the words of truth and help new dialogues and scripts form, grow and gather momentum. And this is where using words to create truths is a good thing. 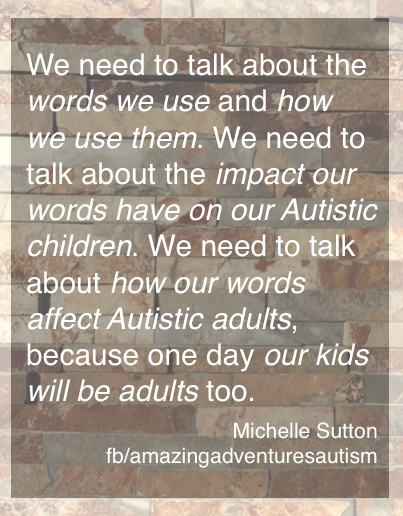 We can work toward creating a new truth that once people were scared of Autism but now they aren’t. We help create the truth that Autistic people are recognised as the true experts on Autism instead of the professionals trying to get peoples money. I want my children to live in a world where that is truth. Truth is a big one for those of us on the spectrum with whom i am familiar. We don't whitewash or rationalize and we expect the same of others, which is one reason misuse of words can be even more harmful to us. Thank you for espousing TRUTH.